From Trash to Treasure! | Super Stay At Home Mommy! 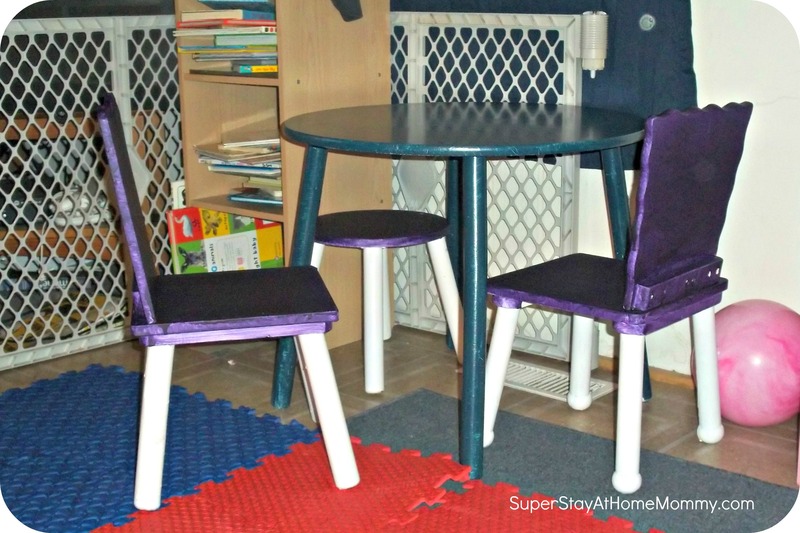 Recently, I snagged a couple little chairs and table on Craigslist for $5. I was looking for a little place for Linnaea to sit down and color, and this was perfect! 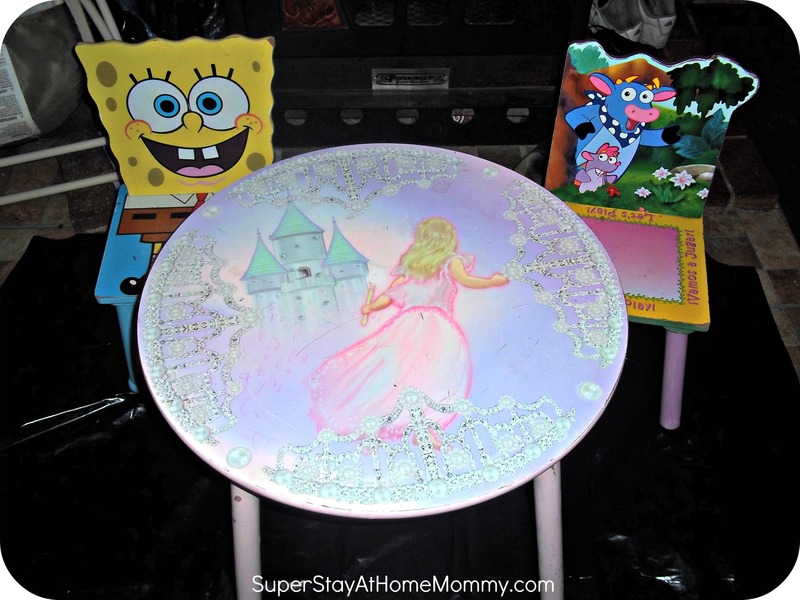 There was just one thing wrong… The chairs were covered in cartoon characters (Dora and Spongebob, which we don’t watch here), and the table had a picture of a princess and was covered in scratches. Since they were going to go in our living room (the room Linnaea has officially taken over as her playroom), I needed them to look more presentable. 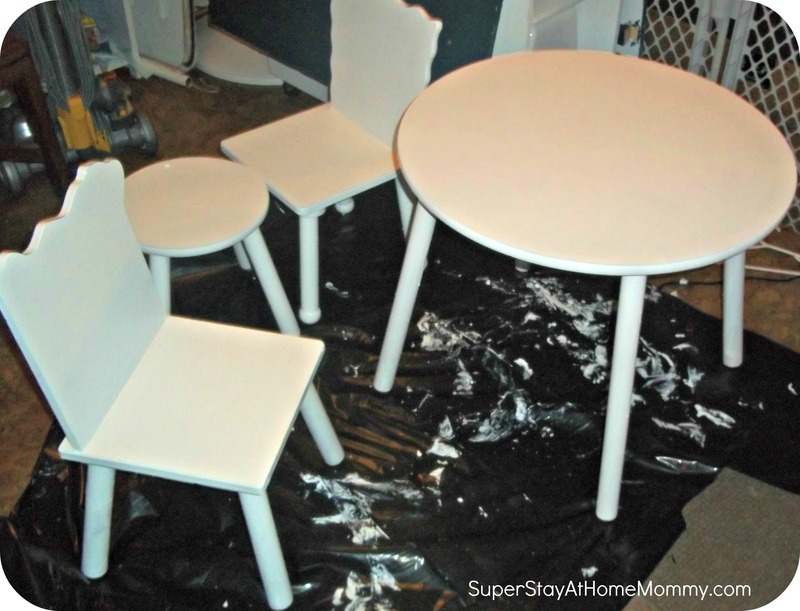 So, I decided the easiest way to go about doing that was priming and painting the whole set. This ended up not costing me a penny! How did I do that, you might ask? Well, we had a little primer left over from a previous project. For the paint, I went to Ace Hardware on a weekend when they were offering a free quart! They do this occasionally, so keep an eye out and grab a quart next time you see the deal going on! You never know when you’re going to need some paint! Here’s some before and after pics, I am quite pleased with how they turned out! Before.... Even if we wanted to, we just couldn't leave the chairs this way. Linnaaea was terrified of the giant Spongebob eyes staring at her! After! Her table and chairs set up in her little corner of the world 🙂 Total cost- $5! In researching online, I found that I saved anywhere from $45 to $100! (Depending on the set of table and chairs you get). Keep an eye out for deals, it pays off!